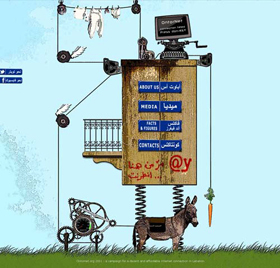 As of late, a couple organizations campaigning for faster internet in Lebanon have been birthed. One of them, Ontornet (a play on the Arabic ‘Ontor’, colloquial Lebanese Arabic for “wait for the net”), has already started to gather quite the buzz locally and internationally. Most people in Lebanon believe that the internet is so hampered here due to political conflicts and financial interests in the region. The government has made no secret of its messy relationship with the two mobile phone providers in Lebanon. In addition to that, the Lebanese have not stood up and vocalized their concerns, and their needs. Ontornet is that voice of the people, aiming to raise awareness about the internet situation in the country. Not to focus on the personal aspects of annoying and slow internet connection, anyone working in the country knows just how bad the internet here is, and how that in turn translates to frustrating and longer working hours. At the end of those working hours, one still has not finished his or her task list. Looking at the bigger picture though, faster and more efficient internet could only be a positive thing for businesses, the country and the economy. What are your views and thoughts about the internet in Lebanon and the region? How does it affect you work?